Trekking makes you a different person. It makes you feel alive and when I say alive that means really really alive. The mountains, the trails, the celestial horizon and the starry sky become one with you and you feel huge and universe like. When you reach the top and back, you feel like you can do anything, fulfil your every dream and time actually feels relative. Your life no more feels like baggage but you become the source of energy. For those who have already fallen in love with trekking can pretty easily relate to this but for some of us who had a bitter experience while trekking just because of missing the comfort while taking rest, it might look like a nightmare. I have some good news for you. You can now crowdfund and book the adventure pack that warms you and your gear as well. The Hot Pocket has raised US$ 218,042 with the help of 1756 awesome backers with 24 more days to go before the campaign ends. If you have been trekking, you must know how important it is to take proper rest so that you can continue your journey without being a drowsy creature the next day. The Hot Pocket is available in 3 size options and you can claim any one of these for $99. 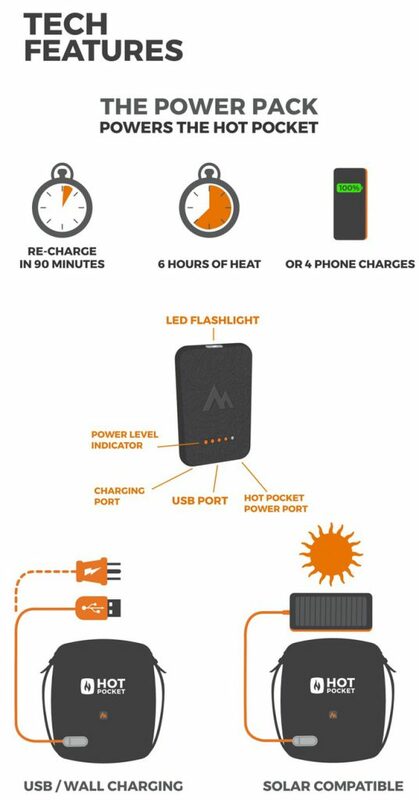 With Hot Pocket, you can preheat your gear, charge your devices or use it for instant warming while you are camping, travelling or sporting an event. Here are some of the tech specification that makes it the all in one adventure pack that warms you and your gear. Hot Pocket can be fully recharged in 90 minutes and can keep you warm for 6 hours. If you feel the weather is not as cold as you expected, you can use it to charge up to 4 phones in that much charge. Also, it supports solar charging. What are you waiting for now, go claim yours and keep trekking?